The Water Vole is a small sized rodent with a dark brown coat of fur that has a number of black hairs scattered across it, and a lighter, greyish underside. The head and snout of the Water Vole are flatter and more rounded than those of other rodents, and it’s ears are generally much smaller. They have a short tail, which is covered in a number of small hairs, and long claws on each of their feet which are primarily used for excavating burrows. The skin between the toes of the Water Vole is slightly webbed, making it easier for this small rodent to swim through the water. Males tend to be slightly larger than females but both are similar in appearance. Water Voles live along the banks of slow-moving rivers, streams and canals and can also be found nesting in the banks of lakes and marshes. They spend much of their time in their own burrow, the entrance to which is often on or just below the water’s surface to protect them from predators. A female Water Vole’s burrow can extend for around 70 meters along the riverbank, while the male’s can be more than double this in length and often occupies the territories of a number of females. Water Voles feed on mainly grasses and waterside plants; they may also eat twigs, buds, bulbs, roots and fallen fruits. Water voles usually have three or four litters a year, depending on the weather. In mild springs the first of these can be born in March or April, though cold conditions can delay breeding until May or even June. There are about five young in a litter, which are born below ground in a nest made from suitable vegetation, notably grasses and rushes. 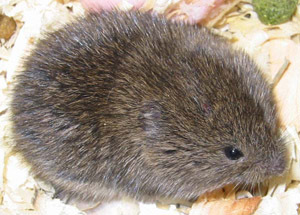 Although blind and hairless at birth, young water voles grow quickly, and are weaned at 14 days. Water Voles are aquatic rodents that lead a diurnal lifestyle, meaning that they are most active during the day when they leave the safety of their burrow in search of food. Swimming right under the water, Water Voles gather aquatic plants which they often take back to the surface to consume. Their burrows are complex systems in the soft riverbanks, that often include a number of chambers, each with it’s own purpose. Areas for sleeping, eating and nesting are created along with latrines on the outskirts of their territory, where faeces are deposited to mark the individual Water Vole’s patch. The water vole is one of our most threatened native mammals, having undergone a dramatic decline, particularly during the latter part of the twentieth century. The reasons for this include habitat degradation and fragmentation, but also predation by American mink. Water voles have many native predators but, unlike the mink, none of these seem to threaten the survival of the water vole. Mink are waterside animals and female mink are capable of following the voles into their burrows. . In the UK, under the Wildlife and Countryside Act 1981, it is a criminal offence to damage or obstruct access to any area that Water Voles use for shelter or protection. This protection however, does not extend to the actual Water Vole itself, but is more a step to protect the declining suitable habitats that remain, as it is the loss of these that has led to such a drastic drop in population numbers. If you suspect you have a water vole infestation in Edinburgh, Glasgow, Aberdeen, Dundee or Perth, call GRAHAM pest control today and we could help.